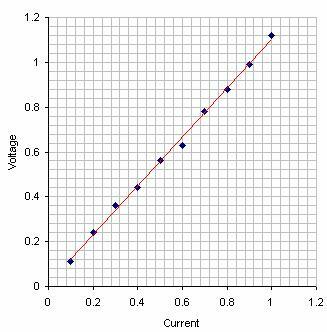 We have seen that if a voltage V is applied to a device, the current I that flows is limited by the resistance R of the device according to I = V/R. Hence a material with high resistance will pass little current (insulator), while a material with low resistance will pass a large current (conductor). In order to make a meaningful comparison of the resistances of different materials, we need to allow for the fact that resistance depends on how much of the material is present. Hence, we define the resitivity ρ of a material as its resistance per unit length L and cross-sectional area A e.g. What is most noticeable is that the resisitivities shown vary over a huge range, from 10+17 Ωm for quartz to 10-8 Ωm for silver. Amongst solids, metals like silver have by far the lowest resistivities i.e. are the best electrical conductors – this is because the atoms of a metal have many electrons that are somewhat shielded from the nucleus and relatively free to move around. Hence, if a voltage is applied to a metal you have a steady supply of extremely light, charged particles to carry the current from one end to the other. Quartz, on the other hand, is an extremely good insulator because the electrons are tightly bound to individual atoms and there are almost no free charge carriers available for the conduction of electricity. In between the conductors and insulators on the table lies a very interesting type of material called a semiconductor: these are materials that are normally insulators, but whose resistivity can be dramatically altered by the addition of impurities (doping). Semiconducting materials are extremely important in the manufacture of electronic devices and circuits and lie at the heart of the microelectronic revolution. How is resisitivity measured in the lab? First, you measure the resistance of a material by monitoring the current through it as a function of applied voltage (see previous post). Then you measure the length and cross-sectional area of the material and calculate its resistivity from the formula above. The inverse of resistivity is conductivity, measured in (Ωm)-1. Many tables list the conductivity of materials rather than the resistivity. There are similarites; for example, gases are poor conductors of either heat or electricity because of low atomic density. However, the conduction of heat and electricity are slightly different processes. In heat conduction, the heat is transferred mainly by the collision of molecules – individual molecules do not change position and the energy is carried as a ‘chinese whisper’ (the electrons also play a role, but it is rather random). In the conduction of electricity by metals (or other good conductors), the electric current is carried by electrons that are essentially free to move from one place to another. A constant voltage applied to a good conductor imposes a drift velocity on the electrons , and a current flows – this is a much more efficient process than heat conduction.